How often has buying a car required a prerequisite demand to “hold my beer” upon purchase? Today’s Nice Price or Crack Pipe Saab might just be the first. It’s described as ‘the most dangerous car under a grand that Craigslist has to offer.’ Let’s see whether it’s worth living on the edge. Usually adding the word ‘Baja’ to anything makes it infinitely better. Take for example ‘fresh,’ which is okay I guess, if you’re a prince of Bel Air or something. Add Baja to it however, and you get Baja Fresh, a chain of fast food restaurants that make tasty burritos and tacos that inexplicably come with a grilled scallion. It’s so cool! Yesterday’s 1989 Chevy S10 was likewise imbued with the Baja - a factory trim package so named -but even that magical appellation couldn’t overcome what was perceived as a too-high price, and it fell in a 59% Crack Pipe loss. At perhaps a lover cost that S10 Baja would be the perfect complement, denominationally, to an Alfa Romeo Aflasud. Alfa once sold a car called the 164 that had shared its development with Fiat who sold the same basic architecture as the Chroma and Lancia Thema, and Saab which sold it as the 9000. Two of those four were sold in America, and today we have one of those to consider. This 1994 Saab 9000 Aero represents the most Swedish meatballs-to-the-wall edition of Saab’s ‘Type 4’ entrant. These cars topped out with a 225-bhp edition of Saab’s turbocharged DOHC 2.3-litre four. Not only that but the company’s ZF automatic cog box wasn’t up to the task of handling that engine’s 258 lb-ft of torque so automatic-equipped Aeros got the 200-horse/238 lb-ft CSE mill. This one rocks the five-speed stick so it’s factory numbers were head of the class. The ad however says that it has a fatter snail under the hood and is boosted to apply more pressure than an ISIS recruiter. It also has all the Aero-unique body bits and a pair of factory Recaros inside. That’s all pretty sweet, right? Well, don’t release the kraken quite yet because it should be noted that the seller describes this Saab as a ‘rolling deathtrap.’ I know, you’re focusing on the rolling part and not the deathtrap part, aren’t you? What’s led the seller to issue this safety warning like he’s gone all Surgeon General on us is the fact that, much like Gary Busey, this Saab isn’t all there. Check out the pictures and you’ll see that the tinworm has taken up residence here, and has invited all his friends over to party. The fender arches on all four corners are eaten through and the seller says that the passenger-side strut is free as a breeze. He notes appropriately that such a situation should give you pause. If instead you’re still going then also note that the car is throwing up a mystery CEL. Despite that, it somehow passed the Massachusetts ‘stringent’ inspectors. Other items on the pro column are a new exhaust, which is described as ‘shiny,’ and which is also described as ‘I hate my neighbors’ loud. Okay, so this isn’t the perfect first car for that neophyte driver on your holiday gift list. In fact, it’s probably not something that should be on the road. Still, the seller is only asking $800 for it and the seats alone could likely be sold for more than that. Then you’d be just a day of TIG-ing away from a gnarly LeMons ride with perhaps a Swedish Meatballs and Swiss Cheese theme. 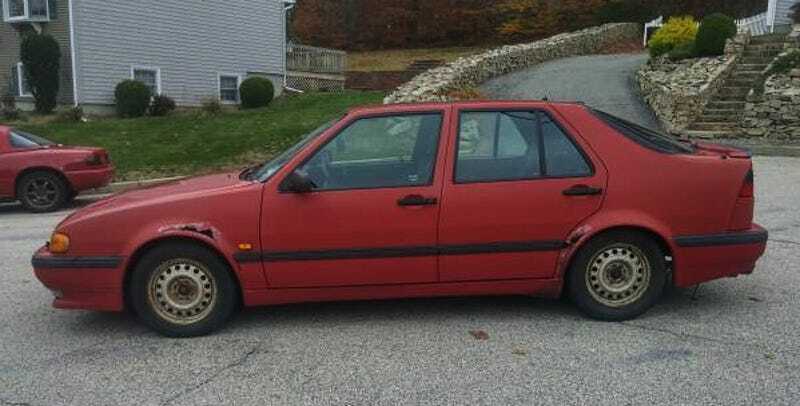 What’s your take on $800 for the ‘most dangerous car on Craigslist for under a grand? Is that a deal to save this Saab from an ignominious fate? Or, is an this Aero that will land I know not where? Rhode Hard and Put Away Wet Island Craigslist, or go here if the ad disappears. H/T to tehkav for the hookup!